This article presents you with a different perspective of how to inspect window messages, to see how applications are communicating and managing their controls. We are not going to explain what window messages are or what they are used for in this article, so we suggest that you read these excellent articles to understand them: Handling Window Messages (Part 1, Part 2, Part 3). In this article we are going to monitor the Message API from the inside by hooking the target process. As a first step when developing, to inspect windows, we open the Spy++ application and start the tedious work of following messages as they are printed in their hundreds. This is helpful most of the time, as we usually want to know what our windows are seeing and receiving. Yet, what happens when we want to know exactly how an application is communicating with its controls (what calls it makes to the message API) or want to see if our messages are getting filtered by someone else? As you may know, Spy++ installs 3 global hooks to receive every Send, Post and Call to a window message handler. The information provided by these methods is not enough to know what messages are coming from our application or if any of them have been filtered by a hook installed earlier in the call chain. What happens with the messages not known by Spy++? How are we going to see them? Look what happens with many of the messages used by the standard ListView in windows. Spy++ does not know anything about them if the window is subclassed (for example ATL:SysListView32), and cannot trace its content. Try following LVM_GETNEXTITEM in Outlook Express and you will only see unknown 0x100C messages. The same goes for custom user messages that you may know and want to follow. We need an application that can be customized to our needs! To probe our theory, we have built this message spying application. We have added to it a way to lookup windows handlers, hook the process owning it, and correctly report the messages and structures. To pick the target window and the process we wanted an interface like the one used in Process Explorer and Spy++. Thanks to Mark Belles this was an easy task. He has a great article on how to implement a nice Window Finder, in Code Project. In order to install a hook, first we need to identify our target process. After obtaining a window handle from our Window Finder, we can use GetWindowThreadProcessId to identify which process owns the window. From there we use the .Net API to access it and tell Deviare which process we wish to hook. For our monitoring we have divided the API in 2 sets: the Dispatch group, and the Sent and Post group. Monitoring messages that arrive to the first group will provide us with a very similar view of what Spy++ sees. This is because these messages arrived to the application and have not been filtered by any hook. With our second group, we will identify direct and asynchronous calls to the Message API. As you see, we easily pick our target process by Id and select its Module and Function by name. The module name is not important, as it is always going to be “user32.dll”. If you have doubts, you can use Spy Studio to watch the process modules and exported functions. Once the hook gets installed, we will receive notifications on our handler. From there we parse the function parameters transparently with the interface provided. (These parameters are actually in the target process, and Deviare copies them to our process on our demand and handles all the communication). After reading all the data we require from the call, we will use our generated Xml to identify the message and properly cast it to its structure and show it properly. The XML document in this application was created specifically to link together the message names, values and parameters. As messages like WM_LBUTTONDOWN are predefined as 0x201 we can place this in a XML file containing information on the parameters WPARAM and LPARAM. <wmisc>wParam Indicates whether various virtual keys are down. This parameter can be one or more of the following values. Windows 2000/XP: The first X button is down. We could not find any database with this information, so we generated an XML document with the messages that we were interested in knowing about. As you can see, it is easy to simply add any message you want. In the process of building this XML, we used a very nice tool called ApiViewer from ActiveVB.de. Just search for the message names you want and you can evaluate the message values from the names. //Ready to use IParam as the structure sent by the OS. 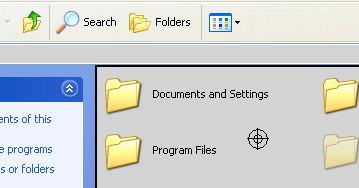 It is possible to do this with all of the structures you can find defined in the windows headers. So, you should be able to cast and read any of them that are used in within these messages. 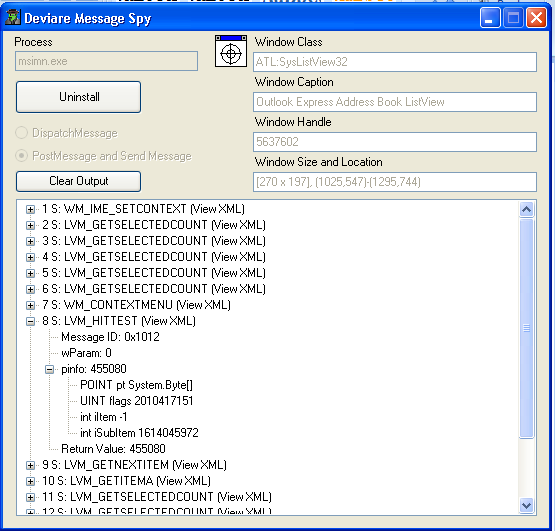 Above we have our Deviare Message Spy in action. We selected the contacts list window from Outlook Express (at the bottom left) to spy on. You can see all the message values that were sent via Post and Send Message APIs. LVM_HITTEST has been expanded to show the full values received. As LPARAM is a pointer to the LVHITTESTINFO structure we can find all relevant information contained within. Hope you enjoyed this article, and found it useful. Let us know what you think! Many messages have the same Hex Address, such as TB_GETITEMRECT and TTM_UPDATE. Both of these messages have the value of 0x41d but are very different messages. The TTM_UPDATE Message Forces the current tool to be redrawn. It does not use the wParam and lParam where as TB_GETITEMRECT Message Retrieves the bounding rectangle of a button in a toolbar. TB is a Toolbar message and TTM is a Tooltip message. As our Spy++ style window finder already finds the window class, such as SysListView32 and ToolbarWindow32, It would be easy to use the class name to tell the program with Xml message is the correct one. Sounds extraordinarily useful. Unfortunately as soon as I hit the “Install” button, Deviare crashes. I have tried to look at the source code with vs 2008, but cannot get it to compile. It fails with “Namespace Deviare cannot be found. Is that what are you looking for?